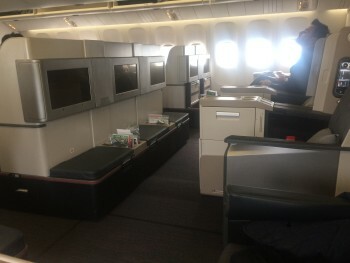 This is my review of Turkish Airlines business class on the Boeing 777 fleet. Just before half term, I popped down to Istanbul for two nights. Having flown extensively on Qatar Airways, Etihad and Emirates over the last two years, I wanted to see if I was missing out. Turkish Airlines is trying hard to compete with the Middle East ‘big three’, but is it pulling it off? 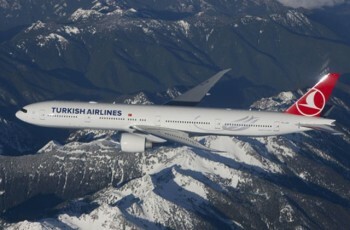 Turkish rosters Boeing 777-300ER long-haul aircraft onto many of its Heathrow services. 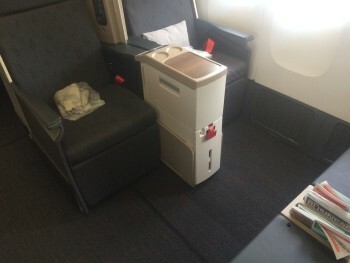 A sale last Autumn allowed me to book a business class return flight from Heathrow to Istanbul for just over £300, which was an excellent deal given the flight length and the flat bed service. Of all the Star Alliance lounges at Heathrow Terminal 2, I decided to visit United Club again in the satellite terminal. I reviewed the United Club lounge here. On boarding the aircraft, I must say that I was not hugely impressed by what I found. Emirates may get criticised for its ‘bling’ but I will take that any day over the utilitarian grey, black and white Turkish cabin. Turkish operates a two-class Boeing 777 fleet. The aircraft have no First Class or Premium Economy. 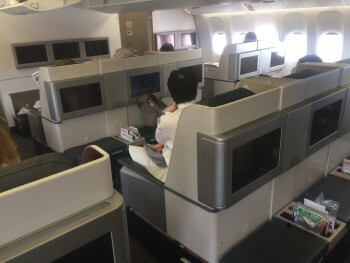 There are seven rows of business class on the 777-300ER. The cabin is split into two, separated by a galley, so it feels small and private. You don’t get the ‘dormitory’ feel that you get on a British Airways 777. I was in 7B. The Seat Guru website says that is a bad seat because the galley and toilets are directly behind it. Er, no! Row 7 may be the last row of business class but the economy cabin is immediately behind you – no galley, no loos. This meant that the seat was very quiet with no passengers walking past me during the flight. The real surprise was the 2 x 3 x 2 seating. Actually, this wasn’t a surprise, because when I checked in the night before I discovered that I had been placed in a middle seat! I swiftly moved to an aisle in a window block. This middle seat is exceptionally undesirable in my mind. Even my own seat, pictured below (aisle) was less than ideal. As you can see, you are sharing a tray table with the person the next to you. You are also very close to your neighbour. There is a small partition you can raise for privacy but it doesn’t go very far. I also found, when I raised the privacy screen, that I killed off all of the daylight from the cabin window and struggled to read. For a couple, of course, this is not an issue and as long as you aren’t in the middle block you will be perfectly happy. You are also very close to the person across the aisle from you. The seats align across the cabin (relatively rare for business class these days) and Turkish seemed to have very narrow aisles. There are luggage bins in the middle of the aircraft (a lot of airlines remove them these days to give a feeling of space) which means one bin per seat! You won’t struggle for storage. The seat was comfy and, when I briefly put it into fully flat mode during the flight as a test, was comfy. I was given a blanket but not a toiletry bag – this was not necessarily a surprise given it was a relatively short day flight. The aircraft had wi-fi (BA is on an ever-shrinking list of airlines which don’t have it on long-haul) but they charge for it. I understand that a free service also has issues (too many people try to use it and the service is painfully slow) but I still believe that business class passengers should receive it for free. I didn’t switch on the IFE on this relatively short flight, so I can’t comment on that. All in all, I was not hugely impressed by what I found. It is, of course, still better than British Airways Club World in terms of space and seat size, but Turkish does not want to be judged on such comparators. It wants to be judged against Qatar, Emirates and Etihad who are setting the pace these days – and, in pretty much every respect, it comes up short. 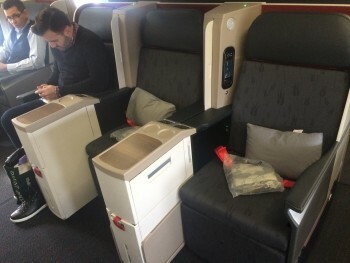 Of course, if you need to fly from London to Istanbul in business class then it is a no-brainer to choose the Turkish Airlines Boeing 777 services over the standard British Airways Club Europe service! Turkish Airlines is a member of Star Alliance. I credited my flight to my Lufthansa Miles & More account – not because it offers a great deal on Turkish (it doesn’t) but because it is my only active Star Alliance account. In Part 2 of this review, also running today, I will look at the food and drink offering. Bits: earn Avios with the Malaysia / Emirates partnership?, changes to BA peak and off peak pricing? OT: I added my family to BA exec and Avios.com as they regularly fly to oz but are not part of any FF scheme! Have joined them to my BA household account (NOT an avios.com one). They have gained some avios via avios suitcase but combine my avios says their details do not match though have checked and they all do. Any idea why or how to go about dealing with this without ringing customer services? They’ve been open less than 90 days but thought that rule only applied for combining avios from Iberia? Have you tried using CMA from both ends? I mean from both BAEC and Avios.com? I sometimes have issues using it from BAEC, but logging in to Avios.com and using CMA from there, for the same transaction, works a treat. Yes, tried both ways and also in different browsers (chrome and IE). Also tried clearing cookies but did not help. 1. The seats are like those found when flying First Class on a domestic flight in the US – much better than an economy with the middle seat blocked. Add to that personal IFE and the fact that I don’t have to sit in the galley to get decent legroom (ahem, BA row 1A/C). 2. The service is good generally, very professional, they care and try hard. 3. I really like the Do&Co food. Far superior in my experience even to BA long haul premium classes. I’m a big fan personally. TK’s A321 in Business Class is infinitely more comfortable (at least on a day flight of 3 hrs IST-LHR) than on their 777 or BA’s (shorthaul) 767 and A320 in Club Europe; the food excellent (both in the IST lounge and onboard) and the fare invariably 10-15% below BA. However, my worst and best experience on TK were on a delayed “for technical reasons” flight IST-AYT where 2 hours in the overcrowded Domestic lounge followed by chaotic boarding and an interminable bus transfer led to a lie-flat seat on an A330 and a superb dinner elegantly and charmingly served on a 57-min. flight. Thanks for the great review as always. Been saving for a Business flight with TK for some time, have to say it doesn’t look as amazing as I was led to believe, perhaps it’s a bit better long haul. Still any chance to get back to the TK IST lounge is good enough for me! Price up a (one way?) on Lufty / LOT / Swiss / Turkish to somewhere in Europe? It is bigger than some airports – it was bigger than the departures area at Salzburg which I used a few days later. It is also a shambles.